John Dorney Reports on a talk by Brian Hanley at the Smithfield People’s History Project. 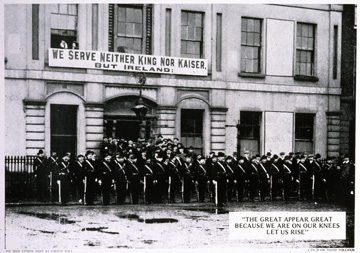 The Irish Citizen Army was founded in at the height of the Dublin Lockout of 1913 to protect strikers from the police. Three years later it took part, alongside the Irish Volunteers, in the insurrection of Easter 1916. 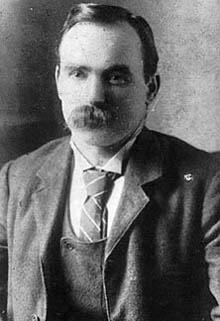 Its leader James Connolly along with his second, Michael Mallin, were executed for their part in the rising. The ICA has therefore long had a special place in left-republican history in Ireland. Connolly’s writings gave voice to a socialist-republican tradition that still has adherents today while the Citizen Army’s participation in the insurrection apparently confirmed that, as Connolly put it, ‘the cause of Labour is the Cause of Ireland’. The ICA were an armed workers’ force, who believed in social as well as nation liberation and they also admitted women on equal terms to men. Such, at any rate is the memory of them today. At this talk in the Cobblestone Pub in Dublin’s Smithfield, historian Brian Hanley tried to put some flesh on the bones of the Citizen Army’s story. The ICA was founded during the extremely violent circumstances of the 1913 Lockout, in which at least 4 strikers were killed by police or strikebreakers, thousands injured by police batons and 7 shot. The ICA, he told his audience, owed their foundation to a number of factors. One was the extremely violent circumstances of the 1913 Lockout (the great dispute over union recognition, about which you can read more here), in which at least 4 strikers were killed by police or strikebreakers, thousands injured by police batons and 7 shot and wounded. Union leader James Larkin, Hanley recounted, told his supporters that, ‘an undisciplined crowd suffers most in street fighting’, while James Connolly called for ‘four battallions of trained men’. However the concept of a ‘Citizen Army’ was apparently common in labour and socialist circles at the time. Two years previously a force of this name had been raised in Wales for street fighting during a miners’ strike. But the ICA was also a product of the militarization of Irish politics. Unionists in Ulster had formed the Ulster Volunteer Force to resist Home Rule in January of that year and both Larkin and Connolly made the point that if northern unionists could arm and drill then striking workers could also. Thirdly a recurring feature of the ICA was the prominent role played by former British Army personnel. The actual founder of the ICA was Jack White, a Ballymena Protestant and son of a British Army Field Marshall and himself a veteran of the Boer War, but who had since developed an interest in radical Irish nationalism and labour politics. The ICA first drilled in Croyden Park on Dublin’s northside on November 13, 1913. During the Lockout, according to Hanley, the ICA was a large but loosely organised group, who stewarded union rallies with sticks and bats. In March 1914, when an rally of the unemployed was charged by the Dublin Metropolitan Police, the Citizen Army, or at any rate those marching with them, fled ignominiously. It was an unpromising start for the ICA. At that point it claimed to have 1,000 members but Hanley told us, was more likely to have had just 300. It seems a long way from this rout to the highly disciplined, though small, force that took part in the Rising of 1916. Moreover, the goals of the ICA seem to have changed radically in those years. In 1913 it was intended purely as defensive force to protect strikers. In 1916 it was engaged in an armed insurrection against British rule in Ireland. How did this change come about? One point that Brian Hanley made was that the ICA in 1916 was in many ways a very different beast from 1913 or even mid 1914 when its first army council was elected and its constitution unveiled. Hanley argued that the ICA was moulded by Connolly into a miltiarnt trade union and republican force, but was not a revolutionary socialist organisation. In March 1914 the head of the Army Council was Jack White, along with Sean O’Casey (labour activist and writer), James Larkin was the vice chair, along with the pacifist and labour sympathiser Francis Sheehy Skeffington. None of these people were still involved in organisation in 1916. Larkin had left for America, White and O’Casey both quit in an unseemly row over whether or not the ICA should cooperate with the nationalist militia the Irish Volunteers (White left to join the Volunteers, O’Casey resigned because the ICA was, he thought, too close to the ‘bourgeois nationalists’). Of the 24 people on the Army Council in 1914, only five took part in the Rising of 1916 (among them notably were Constance Markievicz, William Partridge and PT Daly). This meant that the ICA passed into the hands of James Connolly, now head of the ITGWU, who moulded a smaller but armed and well trained Citizen Army into a force that contemplated taking part in an armed uprising. This, Hanley argued showed Connolly’s increased radicalisation, prompted by the failures of socialists to stop the outbreak of the First World War and the acceptance of mainstream Irish nationalism led by John Redmond of Ireland’s participation in the British war effort. Many union members (and probably some ICA members) in Dublin were either called up as reservists or joined up voluntarily. How revolutionary was the ICA? Hanley argued that the beliefs of the average ICA member were probably not that different from those of militant separatists in the Irish Volunteers (after the split with the pro-war National Volunteers in 1914) and the Irish Republican Brotherhood. Their constitution was vague on the Army’s aims, except to say that the Irish people should control their own destiny, political and economic – an assertion that could be taken as a manifesto for social revolution or the most conventional nationalist position. What made the ICA distinctive in practice, Hanley argued was not socialist ideology, but the background of its recruits. They had been out on bitter strike in 1913 and for the most part came from Dublin’s unskilled working class. The Volunteers, by contrast, tended to be, in Dublin recruited from the ranks of skilled workers and in the case of their officers, from the middle classes. When the Volunteers were founded (also in November 1913), ITGWU members heckled one of their officers Laurence Kettle, whose family was embroiled in a violent dispute with their agricultural labourers in Swords in north Dublin. On two occasions in 1915, Connolly used the now armed and quite well trained ICA in labour disputes in Dublin, not only to protect pickets from the police but also to intimidate employers at Dublin Port into granting wage increases. However, the idea that the Citizen Army were a ‘red guard’, Hanley said, was flawed. The ICA became integrated into separatist politics, forming part of the guard of honour at the funeral of veteran Fenian O’Donovan Rossa, for instance in 1915. At some point in that year, Connolly was invited onto the ‘Military Council’ the secretive group of IRB and Volunteer leaders who planned the Easter Rising. Most Citizen Army fighters were religious (some Protestant as well as Catholic) and most took communion in the weeks leading up to the insurrection in 1916. Similarly, according to Hanley, while The ICA in theory took in women on equal terms with men, he had found records of no more than 30 female members and they tended to act as nurses and messengers rather than as fighters. Only two he argued (Constance Markievicz and Margaret Skinner) can certainly be shown to have carried arms in 1916. Unlike most male members, a significant number of the women were middle class radicals – notably Markievicz (in fact a blue-blooded aristocrat), the doctor Kathleen Lynn and activist Helena Molony. Hanley made the point that compared to the Volunteers, who in April 1916, mobilised just 1,000 or so of their 6,000 members in Dublin for the insurrection, the smaller and more tightly controlled ICA did much better, with 250 out of 340 members turning out to fight. Some 14 of these were killed in the week’s fighting and Connolly and Mallin executed afterwards. (Some more, notably William Partridge died in captivity). In the immediate aftermath, some of the provincial press blamed the Citizen Army alone for the Rising, arguing that the destruction of property was typical of ‘Larkinism’ and ‘syndicalism‘. Cumann na mBan activist Mary MacSwiney in Cork similarly bemoaned the fact that Volunteers had apparently been led by the nose by ‘Larkin’s crowd’. The ICA stayed together after 1916 but never regained their former prominence. Most of the Citizen Army prisoners were released by mid 1917, as part of the post-Rising amnesty. While they did regroup, the organisation never regained the prominence that it had had previously. Hanley made the point that the trajectory of members subsequently was unpredictable. Many of the most militant went on to join the IRA and Sinn Fein. Several hundred stayed together and played some part in the subsequent War of Independence – especially helping to smuggle weapons through Dublin Port. In The Civil War of 1922-23 ICA members could be found on both sides. The organisation was briefly revived by the left-republican group the Republican Congress in 1934, but it had little impact in the politics of that, very different, era. In all Hanley concluded that the ICA was a workers’ army but not an explicitly socialist force. Its distinctiveness lay not primarily in where its members thought Ireland was heading but in where they came from, the poorest of the Dublin’s working class. The thesis that its women were not primarily combatants may be debateable (Kathleen Lynn for instance seems to have commanded the ICA outpost at City Hall during the Rising) but is also worthy of consideration. 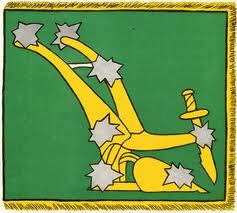 Nevertheless the Citizen Army and its symbol the Starry Plough flag have come to symbolise for some of the most radical republicans both the promises and the disappointments of nationalist revolution in Ireland in the early 20th century. You can listen to Brian’s talk here. Written by: John_Dorney on 4 November, 2013.on 7 November, 2013. 3 Responses to "The Formation of the Irish Citizen Army 1913-16"
CAPTAIN CHRISTOPHER POOLE , NO MENTION ?